What is the potential for new governing structures to intervene in persisting social, cultural, political and economic inequalities that disproportionately accrue to Māori? 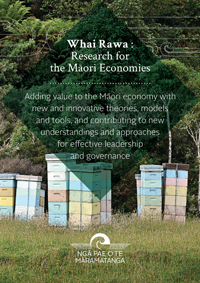 The multiple accountabilities of Māori leaders to whānau and community members, beneficiaries and external stakeholders make Māori governance challenges unique. Māori entities are collective, ancestry based and do not have easy exit mechanisms for owners and so Māori governance poses complex challenges. The overarching research question is: what constitutes entrepreneurial ecosystem efficacy with respect to indigenous entrepreneurs’ innovation intentions and activity? In order to investigate this overarching research question, the following questions will be explored: (i) how do Māori entrepreneurs think about innovation? (ii) How does enterprise assistance support Māori entrepreneurs’ to innovate? And (iii), what are the implications for enterprise assistance targeting Māori entrepreneurs? Jason MIka is a senior lecturer and Co-Director of Te Au Rangahau, the Māori Business & Leadership Research. His research interests include indigenous entrepreneurship, management and methodologies.